The best stories from history lie beyond the margins of textbooks, says the historian. He tells us about five extraordinary tales from the past, from visions of the Virgin Mary to the golden age of the American con artist. Here’s the text of a long interview that I gave to the brilliant The Browser site about ‘hidden history’ – what it is, what bits of it are most worth reading, and why we should care. I’m pretty happy with how it came out, and if you like the sort of stories featured in this blog and are looking for some recommendations for further reading, it’s not a bad place to start. Will you start by telling me what you mean by “hidden history”? For me, it’s the history that exists beyond the margins and the textbooks and what we normally consider to be history: George Washington, Henry VIII, Hitler. I have the capacity to be interested in pretty much all history, because it’s all about us being human. But I’m most interested in stuff no one else is interested in – I really like knowing things that other people have missed out on. All the books I’ve recommended are about periods and episodes in history that are little known but which I find peculiarly fascinating. I think that’s because they are all, ultimately, about the extremes of human experience. We can learn a lot about ourselves as human beings by seeing how we react in instances where we are confronted by extremes – whether they are economic, as in my book Tulipomania [about the 17th century tulip market in Holland], or life-threatening, as in Batavia’s Graveyard [about a Dutch East India company ship that was shipwrecked in 1629]. And all these books you’ve chosen, as well as your own, are very much about the individuals and their stories? Yes, I’m interested in the ordinary people of history. One of the things I try to do when I write is to dignify them by showing a bit of interest in their lives and what happened to them, rather than treating them as if they’re another disposable number, which is how, quite often, they were treated in life. All these books I’ve chosen have a similar sort of approach. For example, Joseph Mitchell is renowned for taking seriously people who were very much at the margins of New York society. And one of the things I like about Batavia’s Graveyard is that it’s really wonderful at helping you, the reader, imagine what people’s lives were like in the past – their surroundings. At the beginning, I really felt like I was in 1620s Holland. Let’s go through the books and tell me a bit about each of them. 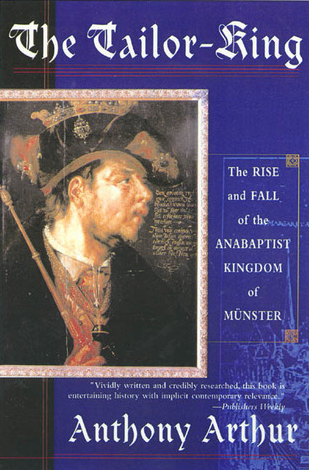 The first one is The Tailor-King by Anthony Arthur, which is about the Anabaptist sect and the takeover of Münster in 1534-5. Today’s Anabaptists have the reputation of being the most pacifist people you could possibly meet. The Amish, a Mennonite group, are the most obvious representatives that most Americans know. But they came into existence as a direct reaction against the unbelievable events that they were involved in during the 16th century. At core, Anabaptism was then a millenarian cult. One of their prime beliefs was the imminence of the second coming, which could only be achieved by building a new Jerusalem for Christ to return to. The central purpose of this religion in its early stage was to bring about the various prophecies in the Book of Revelations. So they looked for a town that they could take over and rebuild as a new Jerusalem, and Münster – which is in northern Germany, near the border with the Netherlands – was the one they managed to get hold of. At first they infiltrated it peacefully, taking over elements of the town council. Eventually they issued a call to all their co-religionists to gather there, expelled everybody else and fortified themselves against the inevitable counter-strike. This was led by the Bishop of Münster, who was rather unhappy about being expelled from his bishopric and who assembled a large army of Catholics outside. There was a year-long siege. Inside the town, things started to get really quite weird, very rapidly. The Tailor-King is about what happened during the siege. The man for whom the book is named, Jan van Leiden, came from a very humble background as a tailor’s apprentice, and ended up as the leader of several thousand Anabaptists. It was essentially a prototype communist community. Everything was to be held in common, all their goods and chattels were to be shared. But, of course, as is quite often the case with these types of leaders, they generally benefit themselves quite substantially. For example, one of the things Jan ordained was that there should be polygamy. He ended up with 16 wives, and the whole thing ended up rather horribly, with a massive assault on the walls. Almost all of the inhabitants, including women and children, were cut down and slaughtered, but Jan and two of his chief lieutenants were captured, tried, and torn apart with red-hot pincers. I think of Anabaptists as referring to a belief in being baptised as an adult. But it sounds like they were rather more radical than that? Out of the 340 people who had been on the Batavia, about 280 survived the wreck. About 20 or 30 of them were women. Corneliszoon had been planning a mutiny on the ship, and with his gang of cutthroats at his back he essentially took control of all the weapons. They end up on a little island which was the size of three football pitches put together, and there was no way off because nobody in those days could swim. So these 20-odd mutineers had all the weapons, all the power, and they set up a community to suit themselves. They started by killing all the people who were most likely to threaten them, then they started killing the people who they thought were eating all the food supplies, and then they started killing the people who were left, just for fun. In the course of doing that, they did set up a community where all women were held in common. They were corralled into a central tent, and anyone could have one for the night. Some of the communal beliefs that Corneliszoon was propounding might well have some sort of echoes of those early Anabaptist days. He was himself Mennonite. 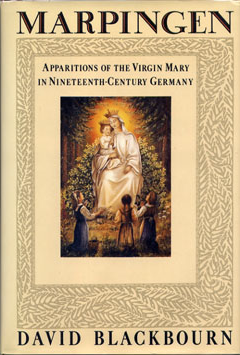 Let’s go on to Marpingen by David Blackbourn, which is about a village in southwest Germany under Bismarck, and visions of the Virgin Mary. David Blackbourn is an incredible historian. I encountered him because I was looking for a readable history of Germany in the 19th century, which is the time it becomes really, really important. He’s a British guy who is a professor at Harvard now and he writes really well and clearly, mostly in an overarching analytical style, and he’s writing histories of centuries. Marpingen is the opposite. It’s an incredibly detailed, minute study of what happens in one village at a time of crisis. It’s the 1870s, and it’s a tiny mining village in the Saarland, on the border between France and Germany. The Franco-Prussian War had just ended. There had been fighting quite close to that area, and people from the village had been killed. As a result of the war, the German Empire has been formed by Bismarck. Before that, at one point Germany was several thousand tiny little territories that were part of the Holy Roman Empire, and up to the 1870s there were still three dozen separate jurisdictions, from quite large kingdoms down to little city states. Bismarck wanted to turn all these people into Germans. One of the chief dangers he faced was from the Catholic Church, so he introduced Kulturkampf, the Culture War, which was an attempt to stop Catholics from being loyal to the Pope and to undermine their influence in the German Empire.Marpingen was predominantly Catholic and was placed under tremendous stress and threat by this. One of the ways in which it responded is that a whole series of visions of the Virgin Mary were seen by two or three village girls. The place then became a huge place of pilgrimage and it was the Lourdes of Germany for more than a year. Blackbourn did an unbelievably detailed study – looking through all the ecclesiastical archives and the local archives that nobody else had ever bothered to look at – to understand why these visions were taking place in this village, what had caused it and how they responded. I’m very interested in how strange events like this happen, and he’s the person who has done the best, and by far the most detailed and revealing, research on any of these sorts of cases. He’s certainly not a believer that the Virgin Mary literally appeared there. One of the reasons Blackbourn is so good is that he explains it terribly well from original testimony. These girls were out in the forest picking bilberries at twilight. They came back past a large stack of wood, with the light side facing outward. In the gloaming, it looked sort of white. So they saw something which didn’t look at all like the Virgin Mary, and yet they reported it as the Virgin. One interesting thing is that originally only one of them said that she saw Mary, and the others went along with it, which is quite typical for these types of visions. To explain all that, you have to understand all the stresses and strains in their society. There was obviously a longing for something to happen. Blackbourn is very good on what that longing is and where it comes from. Why did it come to an end? For quite a long time it did appear likely that it could turn into another major miracle site. What you need is a combination of circumstances: You need to have a village priest who backs it, you need to have people in the village who believe in it, you need to get some profits from it, I suspect, as well, and for a while Marpingen did make quite a lot of money out of the trade. But things didn’t quite coalesce. The priest wasn’t sufficiently in favour of it, the girls weren’t quite credible enough, they wavered a little bit in their stories. People started leaping on it, and German society was, perhaps, more sceptical of these visions because, unlike France or Portugal, it wasn’t an entirely Catholic society. There was more serious examination of these stories than maybe took place in some purely Catholic societies. David Maurer is another remarkable character. He’s dead now, but he was a professor of linguistics at the University of Louisville. His basic academic interest was criminal slang. He was very interested in the way criminals used slang to disguise their intentions from people. The people who most need that ability are conmen because they deal face-to-face, for long periods of time, with the people they try to cheat. It’s important for them to be able to communicate certain bits of information to each other without the person they’re trying to cheat realising there is anything awry. Maurer himself was a great big burly bear of a man, over six foot tall, a very active, outdoorsy type. He had a natural ability to get on with people and he used to go and visit prisoners in jail and get them to talk to him. He made friends with one or two conmen and got them to tell him their stories. This was in the 1930s, and it was the first time that any of them really revealed the inside secrets of their profession. He gradually got referred from one conman to the next and he started to excavate the whole story of the amazing confidence games that they’d been pulling. He did this at the right time, because the great golden age of the conman in America was the 1920s. A lot of people had made a lot of money from World War I, very easily. And, of course, when that sort of thing happens the people who have made the money convince themselves that they’re business geniuses, not that they just got lucky when it was almost impossible not to make money. These people who became wealthy quite typically had done so because they knew someone who knew when a contract was going to be awarded, or they had some bit of inside information on something, something very slightly shady. These are the classic people who fall for the conman’s line. 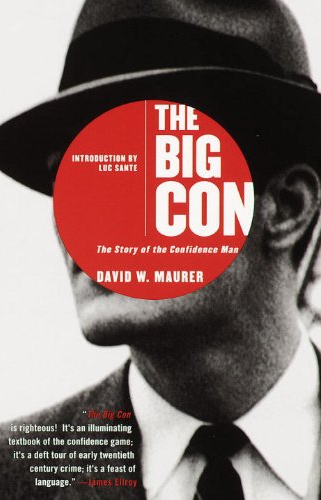 What Maurer did was he found out the story of what are called “the big cons”. This is not when you take $10, $50 or $100 off somebody, but when you stay with them – potentially for weeks or months – and you take off with their entire life savings. The most amazing thing that comes out of this story is not that these conmen were so skilled that they could not only do this repeatedly with a wide variety of different people – using tricks to cool people off afterwards so they don’t go to the police – but that they were quite often able to con the same person more than once. They actually persuaded them they hadn’t been cheated, and they came back for more. Give me an example of one of their tricks. If you’ve seen the movie The Sting, essentially, that’s the technique they use. It’s a fake betting parlour, or a fake stock office, and the conman claims to have a variety of inside information, which is often in the form of information about a horse race that’s taking place. Someone is holding up the wire down at the telegraph office so they can get information about which horse has won early, and they can place a bet. Of course the joy of this from the point of view of the conman is that in bringing a mark in on this, they have to accept that they’re taking part in something illegal. That makes them very, very unlikely to go to the police afterwards. So there’s an escalating series of wins that the conmen allow these men to make, and at the vital moment, as you see in the movie, there is some confusion over the exact nature of the information given, the guy thinks he’s betting on a horse to win which is actually going to come second, and that’s when the whole thing collapses and he loses all of his money. But quite typically, because there are several different sorts of conmen involved, the victim will blame one of them but still think that some other guy is his best friend, and he might easily come back for more. Maurer sets all of this out in amazing detail. You get an astonishing insight into an unbelievable underworld of fascinating people. Because unlike the Mafia, which I wrote about in The First Family, conmen are very interesting because they make a living by their wits. They’re not just thugs, they don’t usually use guns. They have to be very intelligent. In order to cheat the widest variety of people they have to be real men of the world, they have to make themselves interesting to all manner of different people, and they have to be extremely quick-witted. So they’re just much more fun to read about. They all have the most amazing names like the High-Assed Kid, the Indiana Wonder, Slobbering Bob and so on, by which they know themselves. It’s usually quite hard to find out what their original names actually were. The whole book is an insight into a subculture which has essentially vanished. Now, the transmission of information doesn’t lend itself to these kind of con games. Have we got better at avoiding them? They still exist, but what happened in those days is that they could set up in a town – where the police were sympathetic and they could bribe them – and they would have these betting parlours open semi-permanently for months on end, and cheat 15, 20, 30 people in a row. What happens now is that conmen are just as clever, but they tend to only be able to get away with single takes. You have a guy who sells the Eiffel Tower or persuades someone they’re going to demolish the Hoover Dam, but it usually only works once, before word gets out. I don’t think they’ve vanished, but I don’t think they’re taking so much money so regularly. 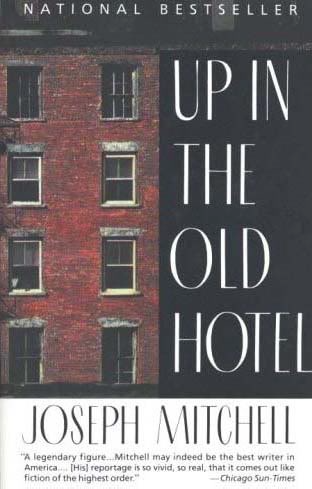 Up in the Old Hotel is your next choice, a collected volume of reportage by the New Yorker correspondent Joseph Mitchell. Joseph Mitchell is by far the best-known person I am recommending here. He is the New Yorker writers’ New Yorker writer. He’s just a genius and the weird thing is that you can’t really work out how he does it. If you look at his prose, it’s so clean and simple that it seems that anyone could do it. But there’s a cumulative effect that is immensely affecting. What he did for 30 to 40 years was to write about all the people on the margins of society in New York. So instead of writing about bankers and financiers and store owners, he would write about tramps and saloon keepers and the guys who ran the dredgers out in the river, and people who led 50-year campaigns to stop everyone in New York from swearing. He did this in such a humane way, it’s just wonderful. He doesn’t treat these people as freaks or weirdos in any way, he treats them as the most human of human beings. And even though they’ve all been dead for 50 or 60 years, when you read Mitchell it’s like you’re listening to them talk. His greatest gift was his ability to listen well. He wrote down huge slabs of conversation, which sometimes would go on for pages and pages, and which give you the most vivid impression of these people, as genuine human beings. He just had a genius for picking the most interesting and amazing people, as well. One of his most famous stories, for example, which opens one of his books, is called “McSorley’s Wonderful Saloon”. It’s the story of a saloon down near Union Square, in downtown Manhattan, which over a period of 90 years had four owners, and each was more conservative than the last. So right up to the 1940s you’d go into it and it would be lit by gas rather than electricity. There would be no cash register and all the inhabitants would be 90-year-old Irish guys who just went there because they had nowhere else to go during the day. They were living off tiny pensions, and would be allowed to sit there nursing one mug of ale all day long. It’s just this weird, unchanging look back into just after the Civil War, which is when the place was set up, the foibles of the successive owners, and the way they ran their bar. It’s treated in such a wonderful warm way, you just want to go and have a beer there, essentially. And it really brings the history to life? Yes, because this is the history most people knew. New York, of all cities, is a huge melting pot of nationalities and striving. Most people think of it as a place where you have some great piece of good luck that transforms your life. You work hard and you live the American dream. But for 90% of the people that went through it, that didn’t really happen. They ended up scuffling around the margins, making a living of some sort for themselves. Those are the people Mitchell is writing about. He’s writing about everyman, everybody. Most people who write about New York are interested in success – the history of Wall Street bankers or the guy who set up Macy’s [the department store]. You get the impression that New York is the town of success. It’s not. It’s the town of losers. It’s full of people who can’t quite make it. And yet they retain something of themselves. They are not subjects of pity. That’s the incredible thing about Mitchell’s writing, you actually quite envy them in some cases, because they are living life on their own terms. Tell me about your last book, The Secret Lives of Trebitsch Lincoln, who sounds like the most extraordinary character. The reason I love this book is because it’s the sort of the story that, as an historian, you dream of stumbling over. Bernard Wasserstein, who wrote it, is a bona fide professor of history and he has a preface at the beginning of the book where he sets out in rather fascinating detail how he came across this story. He was in the Bodleian Library at Oxford University one day, it was pouring and he had half an hour to spare before the library shut and he didn’t want to go out in the rain. So he just started leafing through the catalogue, and he came across a name, a guy called Trebitsch Lincoln. He was a Hungarian Jew who fled to Britain, where, for want of any other way of making a living, he became a missionary trying to convert Jews to Christianity, which is a really difficult job. I’m not sure he actually had any successes in the two or three years he was trying to do this. From there he got to know the Rowntree family, who are well-known in England for making confectionery. They were one of the main employers in York, where they had a huge sweet factory. They were tremendously interested in social justice and sponsored amazing surveys of poverty and tried to work out why people were poor. And they discovered that they weren’t poor because they were alcoholic losers, which is the way British society treated them at that time, and that they were genuinely deserving of help. Lincoln got to know the family and through them he managed to get himself elected as the Liberal member of parliament for Darlington, which is a medium-sized northern town. He served for a year or so in 1910, and when he lost his seat, he decided to turn all this society backing that he had to his own personal profit. He started offering to spy for various enemies of Britain – the Germans and Austro-Hungarians. They didn’t know quite what to do with him because he was such a weird character and they didn’t entirely believe he was genuine or knew what to do, but he started dabbling in espionage. When war broke out, he was imprisoned as an enemy sympathiser and he spent the duration of the war in jail. Afterwards, on his release, he went to Germany and fell in with the far-right-wing plotters who took over Berlin for a short period in the aftermath of World War I – the Kapp Putsch. He became a minister in the Kapp government for about a week before it fell, after which he started living an astonishingly peripatetic life, and he ended up, in the 1940s, living in Shanghai as a Buddhist abbot and collaborating with the Japanese, and planning to go and live out the last of his days in Tibet. Wasserstein just does an astonishingly good job of tracking the story, finding obscure missionary archives from Canada – which turned out to have reams of correspondence from Trebitsch Lincoln – and the records of the Special Branch of the Shanghai police, which had more material about him, and eventually, by some amazing coincidence, he meets the great-niece of Trebitsch Lincoln in Jerusalem and he has the final piece of the jigsaw. So the book as a whole holds together unbelievably well when you consider that it’s about somebody who travelled so much and led an underworld life. Wasserstein manages to put it all together as a story. I’m just tremendously envious of this achievement. I also like the fact that a professor of history has done exactly what I would have done, which is to allow himself to become completely seduced by a weird sidetrack in history and follow it wherever it leads. That’s what I like doing, but he just does it as well as anybody possibly could. But your book Batavia’s Graveyard is also such an extraordinary story. How did you come across that? I used to run Viz, which is quite a famous British comic. It had an Australian edition. I got married and the guy who ran the company said, “Why don’t you go and have a honeymoon in Australia? I’ll pay for the flights, and you can go and spend the week in Sydney afterwards and look at the Australian edition for me.” So I took him up on this very kind offer, and we ended up in Sydney. My wife fell ill in the hotel, and said, “Please can you go and get me some medicine?” On the way from the hotel to the chemist’s I passed a second-hand bookshop, which was fatal. I always go into those places, and my poor wife was left groaning on the bed, while I was leafing through the books on the naval history shelf. I stumbled across the story of the Batavia there. It was relatively well-known in Western Australia, which is where the book I was reading had been published, but nobody else outside the Netherlands had ever heard of it. It was just three or so pages in a book I picked up, and I just thought, this is the most amazing story I have ever read, and I can’t believe it’s true. I started gradually picking up more bits of information, and as I did, I realised it is, quite possibly, the greatest story ever told. Publishers always want books that have novelistic qualities and heroes and villains and beginnings, middles and ends. As a historian you’re always telling them, “This isn’t the way history works, it’s more lumpy than that.” But the Batavia story isn’t. The Batavia story really is a rip-roaring tale that does have heroes and villains and a beginning, middle and an incredibly violent end. If this shipwreck had happened in America, it would have been filmed five times by now. But because it happened in the 1620s to Dutch people whose names no one can pronounce, somehow no one has quite cottoned on to what a great story it is. If you change the names to American names, it would have been a huge bestseller – which is what it was in Holland. As it happens, the only place I’m really well known is the Netherlands. Most of the stories I’ve done I’ve considered to be fascinating, but they’re just too marginal for me to be a gigantically successful author, sadly. You’ll see from my Smithsonian blog that my interests are ludicrously eclectic by anyone else’s standards. I should probably go off and write about Hitler and Napoleon, but I just can’t bring myself to do it.